With the increase of specialization in all areas of electronics technology, ETA International has approved a new Certified Electronics Technician Master Specialist class of certification. The Master Specialty program was created to showcase those technicians who demonstrate proficiency in one specific fields of electronics. 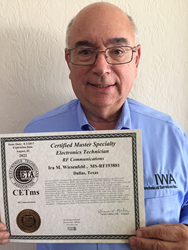 ETA Chairman Ira Wiesenfeld proudly displays his new CETms certification in the area of RF Communications. The Master Specialty program opens the door for many top-level technical professionals who are masters in their specialty area and gives them a credential to validate their higher level of experience and technical mastery gained from years at work. The new ETA® International Master Specialty program allows someone who is an expert technology specialist in a particular field to attain the level of Master Specialty Certified Electronics Technician (CETms) in their niche field to validate their high level of expertise. Why Provide a Master Specialty Program? Because electronics technology has become more specialized and more embedded into our everyday lives, ETA certification areas have expanded to meet industry demand. In many cases, multiple types of certification are now available in one specialty area. It makes sense to offer Master-level certifications in those specialty areas. The initial certification areas identified for this new CETms designation are: information technology, RF communications, and fiber optics, all of which have multiple certifications for expert and specialty levels. Several other certification categories are identified as having multiple related certifications in development and these will be potential additions for the Master Specialty program. ETA hopes to add these to the Master Specialty program soon, which include industrial electronics, smart home technologies (RESI), satellite electronics, telecommunications and others. To attain this level of ETA credentialing, the individual must have at least six years of combined schooling, training, and/or job experience. This person will also be required to have a fundamental basic electronics certification such as either the Associate CET, all five of the Electronics Modules, or the General Communications Technician Level 1 (communications program only), just as with the current Master CET, along with at least four Journeyman-level certifications in one field and six overall. In the newly released Master Specialty CET program, an individual must have four to six certifications in his/her field of specialty. Two certifications of the six required may be in any other two journeyman-level certification fields, or all six certifications may be in any one specialty area. The original ETA Master Certified Electronics Technician (CETma) required six years of work in the field and/or schooling, the Associate CET, plus six different ETA Journeyman-level option examinations with no more than two originating from the same specialized category. It was developed in order to have a credential to recognize and validate those seasoned technicians, engineers and educators who had worked in multiple areas of electronics over their careers and were proficient at a higher level of mastery. When the Master CET program was initiated, there were over 12 different certification journeyman career areas, including Industrial, RADAR, Biomedical, Audio/Video Distribution, Telecommunications, Avionics, Antenna, Satellites, Computer Technology, Computer Networking, Consumer Electronics, Alarm and Security and Wireless Communications. What’s an Example of the New CETms Program? An example might be someone who has worked in the communications field for six or more years. This person may have years of experience and certification, which includes the Associate CET, the Journeyman Wireless Communications certification as well as any of the specialized certifications such as DAS, Microwave Radio Technician, Passive Intermodulation Testing, and RF Interference Mitigation, along with a certification out of their specialty area such as Network Systems Technician or a Termination and Testing Technician certification. They would then be qualified to have the Master Specialty designation with the acronym of CETms and their specialty area would be communications. Many technicians with ETA certifications would qualify for this program today. Others may be just a certification or two away from qualifying for this upper-level credential which conveys many years of work in their field and multiple levels of accredited certifications. How are ETA Master Specialty Certifications maintained? In order to keep the certifications and those who are represented by them accredited, the Master Specialty will be included in the Certification Maintenance program. This will comply with the International Standard for accreditation (ISO 17024) and will keep ETA in touch with those professionals whom it certifies. The general maintenance fees will apply and certificants may choose either a $25 annual processing fee or to pay the four year maintenance fee at one time at the end of the four year certification term. If submitted on an annual basis, this will also renew the person’s ETA membership. Even if a person has multiple ETA certifications, a single payment of $25 per year is the total amount required to keep all of the certifications current. The Master Specialty program opens the door for many top-level technical professionals who are masters in their specialty area and gives them a credential to validate their higher level of experience and technical mastery gained from years at work perfecting their skills in their chosen career.